The External Access feature is used to grant access to company data. The External Access tab can be located by navigating to Account > External Access. 1 A user can have multiple roles assigned. 2 User roles are assigned to a user of an Account. 3 The role with the less-restrictive permission will overwrite the others. 4 Using the user login, a user can Login to all webapps he has a subscription for plus the Admin app. 5 Depending on the account or the user role, a user has different permissions for their or 3rd party accounts in the Admin App. 1 Account Roles are assigned to the Account Login. 2 An account can have multiple roles assigned. 4 Using the Account Login an Account administrator can Login into the Admin app. 5 Depending on the Account or the User Role a user has different permissions within his and 3rd party accounts in the Admin App. Named accounts only → It is always possible to identify the person behind the account. Limited to database admins / operations / head architect / head of support to ensure a running system. Limited List of ADMINISTRATORS must be show to all our customers within the access granting tool. Full access to OWN account & company settings. 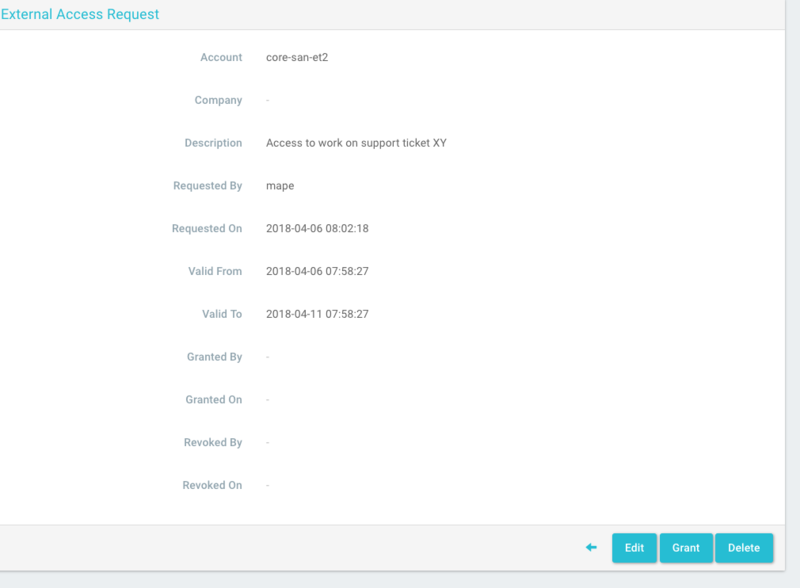 Can create an access request to a customer account or company. Only Coresystems internal or qualified partner accounts. Only users with CONSULTANT or SUPPORT account roles can request access. Account Required. The account associated with the access request. Company Required. The company for which data access is being requested. Description Description. A description of the access grant request. Requested By Required. The user responsible for the access request. Valid From Required. The start date/time for which access is granted. Valid To Required. The date/time on which access will end.